Kara, a young woman treated with fear and suspicion for her ability to communicate with birds, experiences a sudden reversal in fortunes when summoned by the king, who gives her rich gifts and takes a clear interest in her talent. Eventually he reveals – to Kara’s horror – that he wishes for her to use her power to call down dragons, so that he might earn recognition as a dragon-slayer. As readers of the preceding novel, Dragon’s Milk, will know, Kara gained her power when she was nursed by a dragon as an infant; the king’s demand forces her to choose between facing his punishment, and betraying her foster kin. “It was one of those clear, frosty days when the wind snaps your cloak and fleets of clouds scud like warships across the sky. The sun lay low about the mountains, piercing the air with shafts of liquid light that glittered on the fjord and haloed the rime-shaggy firs. […] A whitchild called from a hawthorn tree; I called back. It swooped down and landed on my wrist, eyeing me unabashed, its fierce little claws pricking my skin. I called down a gull, too, which landed on my elbow, and a crake, and a sleepy stony owl that tucked one foot up and tried to take a nap on my arm. ‘Wake up,’ I said, twisting my arm so they all lost their balance and clutched me and wildly flapped their wings. “I hesitated. My eyes, accustomed to the brightness out of doors, gradually made out the shape of the hall. Narrow, horn-covered windows striped the walls, shedding a dim, honeyed glow across a shifting tide of warriors and an undertow of dogs. A darkish smoke-haze lingered high in the network of beams and rafters, where perched a flock of doves. Falconry was/is also one of my pet subjects; the novel weaves in absorbing scenes of Kara working with birds under the tutelage of a taciturn and irascible (of course) falconer, including her own gyrfalcon, Skava. And on the fantastical side of things, Fletcher invents some wonderful details of dragon biology – like the fact that infant dragons, being so full of combustible gases, float in their sleep, until grounded again upon breathing out little gouts of flame. And all of the scenes – often fraught with awe-ful tension – of Kara moving among the wild dragons are vivid and convincing. All told, it made me happy to my roots, to step back into the world of an old, old favorite and find so many of its details as fresh and fascinating as I remembered them to be. 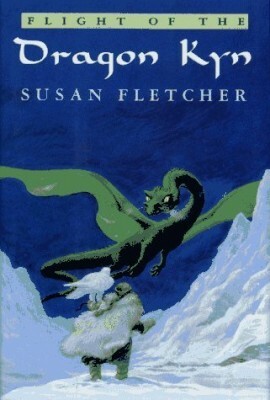 I’m thinking now of also revisiting Fletcher’s Shadow Spinner (1999), a retelling of the Thousand and One Nights’ frame story from the perspective of a young girl who helps Shahrazad to find new stories.